Proper hardwood floor cleaning techniques can maintain the beauty of your hardwood floors for years, but using the wrong vacuum cleaner or cleaning solution could damage the finish and result in expensive restoration or repair bills. Vacuuming hardwood floors or dust mopping on a weekly basis. Fine grit in dirt acts like sandpaper on your floors, and it can ruin the finish. Use the brush or felt-surfaced vacuum attachments to both clean and protect the floor. Avoid upright vacuums with a beater bar or rotating brushes that can scratch the finish. Using only a damp mop only and never on unfinished hardwood floors. If your hardwood floor is not surfaced sealed, never clean it with water. If it is sealed, use a cloth or soft felt mop, and keep it well wrung. Replace the water in your bucket as needed to avoid transferring dirt from one part of the floor to another. When finished, go over the floor one more time with clean water to remove any soap residue. 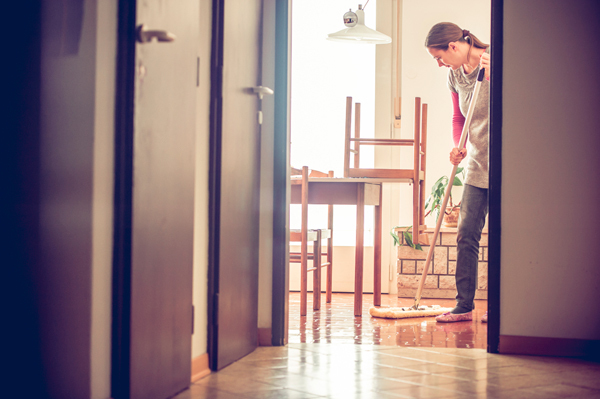 Do not let the water puddle or soak into the floor, as this can lead to expensive hardwood floor water damage repairs. Never using harmful cleaning products on your hardwood floors. This includes solutions that contain vinegar, ammonia, or abrasives. Don’t use furniture polish or waxes that are water or acrylic based, since they can leave the floors slippery. If your floor is sealed, do not use wax, which can damage the finish. Following manufacturer’s recommendations for new hardwood floor installations. Different cleaning and polishing solutions are specific to the finishes, and they can help maintain the integrity and shine of the sealant. For the best in hardwood flooring installation, repair and refinishing services, contact the hardwood experts at Elegant Floors at (650) 961-1339 today .